Admit it or not, but you are waiting for GSP - Koscheck fight. 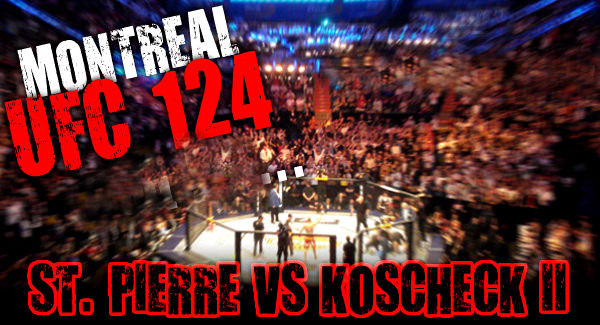 The UFC 124 tickets is on sale next week so you better purchase one or be left out with the delayed telecast. The tickets for UFC’s return to Montreal Bell Centre goes on sale next week. UFC 124, takes place Dec. 11 with a headliner between UFC welterweight champ Georges St-Pierre and “The Ultimate Fighter 12″ rival coach Josh Koscheck. Tickets cost $75 to $600 for Pay Per View. The public sale date is set for Saturday, Oct. 16, at 10 a.m. ET (7 p.m. PT) at www.evenko.ca. As always, UFC Fight Club members can purchase tickets beginning Thursday, Oct. 14, at 10 a.m. ET. And UFC.com newsletter subscribers can buy tickets on Friday, Oct. 15, beginning at 10 a.m. ET.